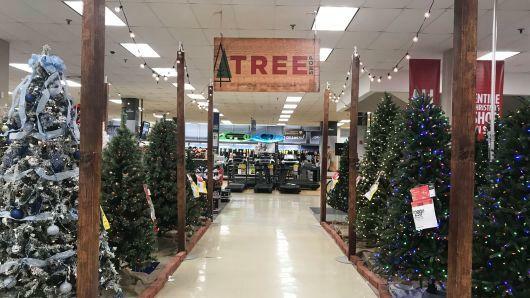 Ten years ago, Sears would be a bustling center of holiday spirit as people of all ages merrily shopped for the best deals in the trusted store at their local mall. Now, the inside of Sears at the company's Galleria White Plains mall is nearly unrecognizable as the same company due to there being nobody inside despite the days Black Friday savings. Hot selling items were marked with signature yellow tags to highlight the "doorbuster sales" and rows upon rows of washers, dryers, and refrigerators sat gleaming as if sitting in an overflow storage facility. The store did see some action at the moment it opened as a handful of loyalists and random shoppers stopped by the White Plains location to see what kind of deals they had. Brandon Warkenthin, a customer who traveled from the Bronx to White Plains to see what the store had to offer on Black Friday said, "This place looks like a ghost town." Warkenthin says he rarely even comes to Sears anymore and only came today because it was Black Friday. "It was a waste to even come out." Warkenthin noted that he was underwhelmed by the sales on the items saying, "They're not really changing the prices." In fact, Warkenthin is probably right as the company is in no hurry to slash prices considering it can barely stay open at this time. The company has been fighting for its life at a bankruptcy court in White Plains about five minutes from the store. The company filed for bankruptcy on October 15th and ever since lawyers, bankers, and advisors have been scrambling to keep Sears afloat. Former CEO and current chairman Eddie Lampert said he is trying to put together a bid for the stores that perform best out of the company's locations. If Lampert's plan is a success, he could save the jobs of some 90,000 Americans and if there is to be any hope of succeeding the toppling retail giant needs some financial gains soon. The problem of having cash at all has been an ongoing issue for nearly a decade. Sears hasn't been able to compete with online retailers and hasn't turned a profit in eight years. Now it needs to simultaneously hold the creditors at bay while trying to keep the doors open in what some would call a "foolhardy gamble". The company has tons of expenses from attorneys in anticipation of lawsuits to creditors seeking what they lent. If the Sears stores don't perform this holiday season, they are certainly doomed and will be just another casualty to online retail giants like Amazon who beat Sears to the curve. Lampert said, "We need to show material progress over the next few months to establish to our senior lenders that a reorganization of the company is realistic and to avoid a shutdown and liquidation." A Sears shopper loyal fan Andy Gill said, "The customer service — I don't see any people around here." He said he used to love coming to the retailer for automotive tools but was also disappointing by the underwhelming discounts. One Sears employee named Jodi Sweed recalls when Amazon had just been founded and Black Fridays were still a spectacle. "It was crazy, it was fun," said Sweed. "You ran on adrenaline all day because you were there and you didn't stop." Another Sears long-time Sears customer named Angel Heuzoechi said, "It looks beautiful — the clothes, colors [light] up the shop." When Heuzoechi found out Sears had filed for bankruptcy she remained unconvinced that this was the end for the former retail giant. "Sometimes it's like that … big shops like this — they hit bumpy roads sometimes, they just rise and fall — and you rise up. And this is one of those bumpy roads.."
how to to earn with Squidoo, then you've come towards right install.